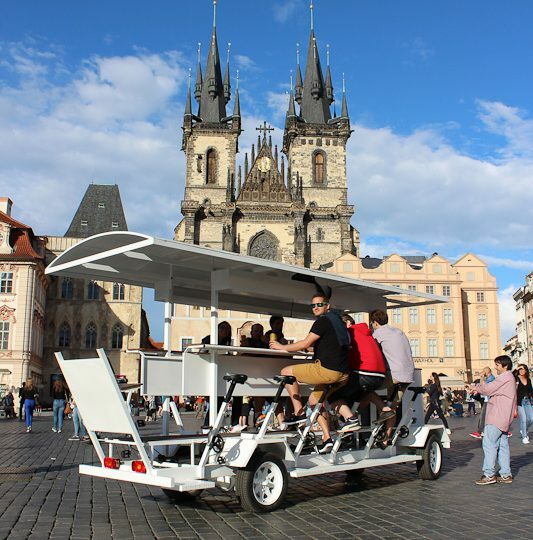 Get to know the history of brewing traditions in the Czech Republic while riding a beer bike. Explore Prague’s best beer gardens, beautiful nature, historical sights and some of the best off-the-tourist-path secrets the city has to offer. Along the way your tour guide reveals some of the unique history about the area, and shows you all the most famous sights of Prague like Old Town Square, Wenceslas Square, Estate theatre and more. Let your guide show you where the locals like to come and relax in the summer sun or enjoy golden fall. Beer is a major part of German culture. Munich hosts innumerable beer gardens but what could be more fun than discovering the city on wheels. Get on your beer bike and burn out some calories while pedaling around the city, accompanied by liters of golden nectar. Any excuse is perfect to enjoy the beer bike: to celebrate a birthday, a hen or stag party, or just the curiosity of discovering Munich in a new and original way. Try it and you will see. Enjoy ice cold Premium Dutch beer while you are exploring all the most famous sights of Amsterdam. Amsterdam’s luxurious limousine party bike takes you through the highlights of the city without having to go uphill. You will receive numerous facts and legends about Amsterdam’s magnificent history from the friendly expert guides. Learn all about why the Dutch capital is one of the most fascinating cities in the world while enjoying a relaxing, easy-paced bike ride.